Jorge Campos is always in a rush. His bulky backpack is strapped tightly around his shoulders like a turtle shell. 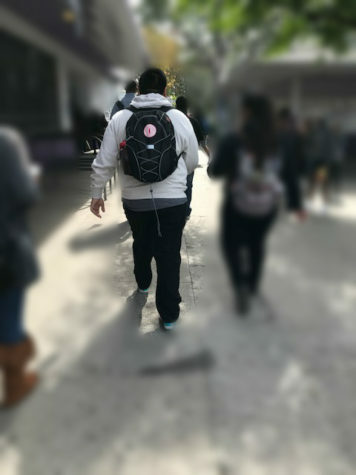 Like a shell his backpack is his armor against the chaos and commotion of South Central Los Angeles. It is where he carries his books and assignments. It is where he retreats when things get tough. A backpack is not the only thing Jorge carries on his shoulders. Since his freshman year he has been responsible for helping to support his family with the bills. He has carried the negative stereotypes that follow young Latinos growing up in the hood. 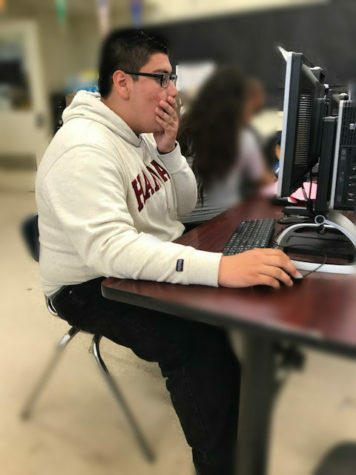 And now, as he makes his way through the chaos of the passing period, black framed glasses balancing on his nose, he carries an acceptance letter from Harvard University. Since the third grade, his mother Marisol Sixto, was already prepping Jorge for a successful future. While most kids dress up as cartoon characters or Dracula for Halloween, Jorge went dressed as a lawyer, tiny tailored suit and a black leather briefcase in hand. In the fifth grade, Jorge was already developing his skills as an entrepreneur. He started a science club at Union Avenue Elementary School to provide other students the opportunity to experience his love of science. He was never the soft spoken kid in class steering away from answering the teacher’s questions. His hand was the first to shoot up, and he was always the last to leave class. Despite growing up on the sketchy streets of South Central, Jorge managed to keep his goals from derailing with the loving support of his mother. She has been his rock and what has kept him humble throughout the years despite his exceptional academic abilities. On two separate occasions, Jorge’s teachers recommended that he skip a few grades. His mother refused. She wanted him to progress normally and not get too ahead of himself. Nothing in school seemed to be out of reach for Jorge. He was one of the very few students that really loved school. “It came natural – just wanting to know everything,” said Jorge. But not everything has been easy for Jorge and his family. Both of his parents immigrated from Mexico 20 years ago in hopes of a better life. His father struggled to find a stable job to pay the rent. For as long as Jorge could remember, his father simultaneously worked four jobs so that he could provide food and clothes for Jorge and his three siblings. After Jorge’s 8th grade graduation, the Campos family was forced to move out of their home in South Central. They frantically searched for a new home, and managed to find a place just before the start of the school year. This experience is not unique to Jorge and his family. This is the reality for many people who are immigrants, but his ability to find hope in dark situations is a quality that sets him apart. While most freshman spend their first year of high school navigating the busy halls, the large classes and the awkwardness that comes with puberty, Jorge was also managing his parent’s financial situation. From keeping their account numbers to paying the bills around the house, Jorge did it all. But like many people, when learning to ride a bike they more than likely will fall a few times before they get the hang of things. This was the case for young Jorge. Money was not really something he had paid attention to before, but after trial and error and reading many articles on financial management, he took control. This was no walk in the park, but it was essential for the family’s well-being. After the first year of this immense responsibility, Jorge was able to improve his father’s credit score and help him find a better paying job. With his father’s stable job, and a steady income with some savings, Jorge and his family were able to purchase a beautiful home the summer before his junior year. The only drawback was that this home was located 73 miles away from his high school. So he faced a difficult decision: move schools and start fresh or continue to build on the legacy he was creating at Manual Arts. He decided to listen to his heart and stay at Manual Arts. But this meant his commute would become much longer. He would have to wake up before the sunrise and be on the bus and train for 5 lonely hours. The same went when school was over. As soon as the clock struck 4, Jorge would rush to the bus stop to head to the train station. Jorge would write speeches analyzing cultures, balance math equations for his calculus class, and study development theories for AP psychology all while sitting on the uncomfortable metal bus seats. With a significant commute and a difficult class schedule, Jorge still wanted more of a challenge in school. So his counselor, Desirie Safotu, suggested to him he try the rigors of The Academic Decathlon. The Academic Decathlon is a class where students intensely study 10 different subjects and at the end of the year they compete with the most elite high schools. At the beginning of his endeavor, he did struggle balancing his A-G classes with the ten subject class. Over the course of his involvement in the decathlon, he gained confidence by being “comfortable standing in front of the world and falling on my face.” That is what has helped him excel in his interviews, which has become his favorite aspect of the decathlon. This year he received a near perfect score on the interview section of the decathlon. He received an outstanding 997 out of 1000. 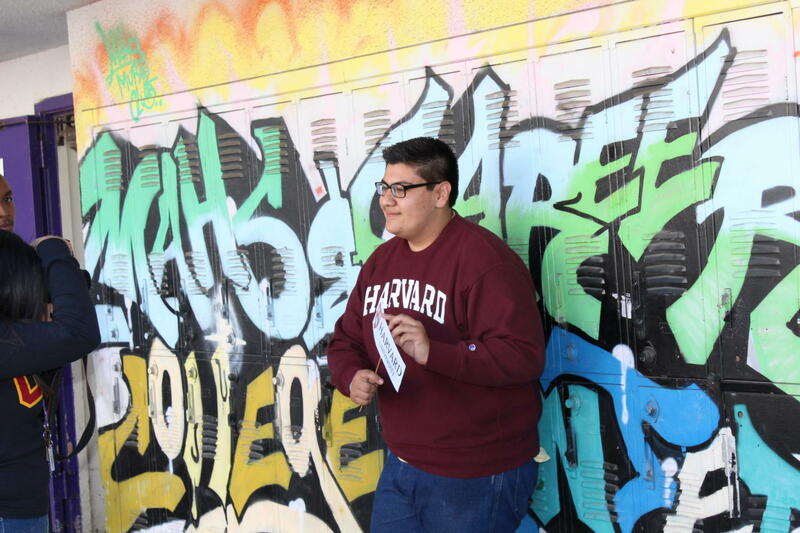 As the school year came to a close, Jorge eagerly awaited news of his acceptance to the universities he applied to. He understood that nothing in life is guaranteed. His experience and the experiences of his family helped him recognize that. But school was the first thing he could control in his life. He did everything he could to put together a competitive application, but the decision was now in the hands of the admissions officers. UC Berkeley and Harvard were his top two choices. It seemed like an eternity while he waited to receive his response from his dream schools. In the back of his head he knew that when he applied he was going out on a limb. There were far more people he believed had an upper hand on him because of his social status. Unlike many other applicants who apply to Harvard, Jorge didn’t have a private tutor or time to do extracurricular activities. Often, he had to put his family’s needs before his school work. Then, on a cold winter afternoon in December, Jorge found himself in the college center for an event celebrating the accomplishments of the senior class. Still no word from his dream school. As Jorge headed out the double doors of the college center to make his way to the bus, he received an email notification on his phone. He rushed back into the college center and made his way to the corner computer in the last row. Smashing the keys on the keyboard, he logged into the Harvard portal as fast he could. 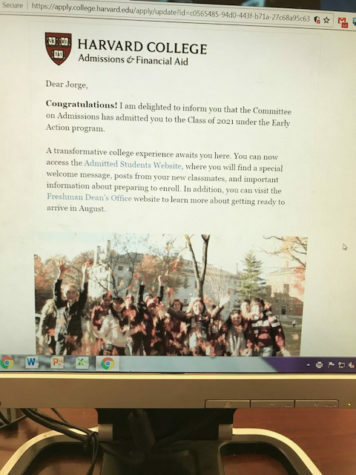 The email subject line read “Harvard.” Jorge sat frozen in front of the monitor. He had prepared for this moment for weeks. He had sacrificed so much during his 4 years in high school to get himself into a prestigious university. Though he would have been happy at USC or Berkeley, his dream was always to go to Harvard. As he opened the email and read the “Congratulations” on the site, he knew that his life would be different from that point on. Jorge had just become part of the 5% of students to be accepted into Harvard College. His first call was to his older sister who was another big supporter. She was so excited that she called her mom, not giving Jorge the chance to tell her in person. A few minutes later, Jorge’s phone rang. On the other end of the line was his mother’s voice. Her voice was shaky with excitement and her congratulations were interrupted by tears. She could not have been happier for her baby boy. Now the journey of his life as a Manual Arts High School student is slowly winding down, but another journey awaits him in Cambridge. This time Jorge will carry a suitcase 3,000 miles across the country. A suitcase will not be the only thing Jorge carries. He will take 17 years of struggle and triumph, the hopes of an entire community and a photo of his family to always remind him what matters most.